In the most simplest of terms, SPEED. 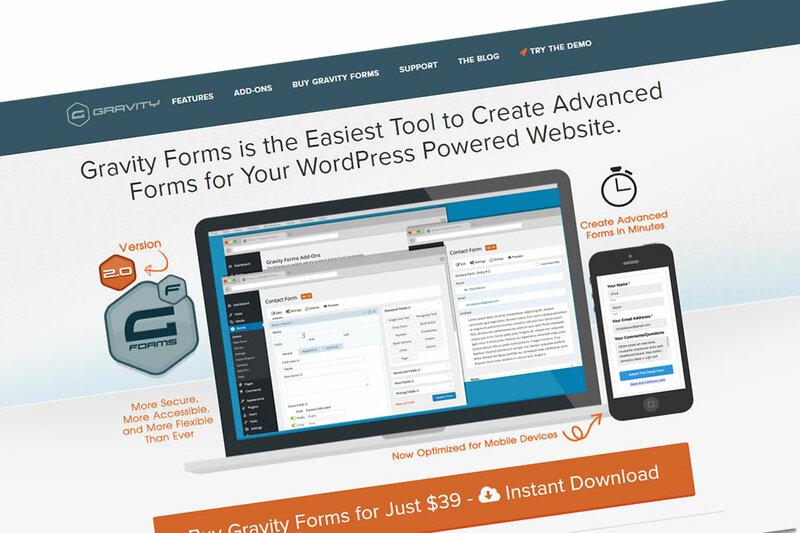 Gravity Forms is by far the fastest and easiest way to create contact forms for your WordPress powered website. It's just that simple. But we don't presume to think that you will just take our word for it, so we will just have to show you. We are going to cover all of the features that you'll find in Gravity Forms but first take a look at this quick video below that we put together. In this video we are going to show you just how fast you can create a contact form for your website. Gravity Forms has a number of built in form features which will allow you to make forms for your website downright simple. Gravity Forms has you covered when it comes to creating your forms. 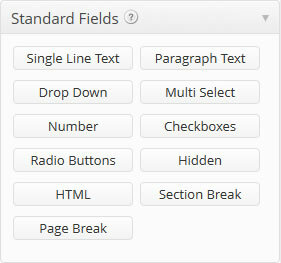 They've got all of the standard form fields you'd expect to find in your form creator plugin. Check it out. Single Line Text field: Just your basic text box. Paragraph Text field: Commonly called multi-line text box. Good for message fields. Drop Down field: Good for when you need to make people select from your choices. Multi Select field: Shows a list of your choices and allows for multiple selections. Number field: Similar to the single line text field, except it only takes numbers and with Gravity Forms you can use the number fields to do some basic math with them. Checkboxes: We all know what these are. Radio Buttons: The flip side of checkboxes, shows a list of choices but only one can be selected, whereas with checkboxes multiple items can be checked. Hidden field: Useful for adding information to get passed on to the email. Such as IP address, Page/Post Id or Title, URL and so on. Section Break: Used when you want to break up the form a little bit. For example, your form has a group of field for personal information. Make a Section Break called Personal Information and you can write some text to go with it like Please enter in as much personal information as possible in the fields below. Page Break: Used when you want to make a multi page form. The advance field list, to me, really is advance. It's a group of commonly used fields, but very useful fields. Name field: Lets you add the name field to your forms fast. You can select whether to get first and last name, first last prefix and suffix, or a simple one box field. Date field: Standard date picker field with the little popup calendar. Phone field: Essentially it's a single line text box but it also has the phone format included. Address field: This is a group of fields combined to accept address information. You can also set it for international, United States or Canadian addresses. Website field: Another field that's basically a single line text box but it includes the http:// in the box itself. File Upload field: Handy little field for allowing people to upload files in your form. You can set the type of file extensions to allow. However you can't set a limit on the file size. Captcha field: While most of hate filling out captchas those of us who receive the form emails don't want a ton of spam emails. 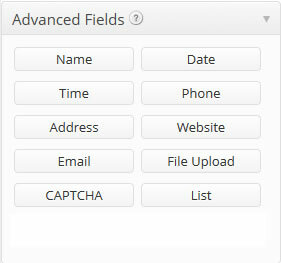 The field lets you add the captcha to your form. List field: This really isn't a field so to speak. Because there's nothing interactive about it. You can use the list field to display information in a table type format. So the advance fields can help you make some forms even faster and easier to make. Or add some additional functionality to your form like file uploads. What are post fields you ask? Have you ever wanted to add the ability for people to create posts on your site? That's right, visitor participation. You can get your site visitors involved with your site and let them write content for you. 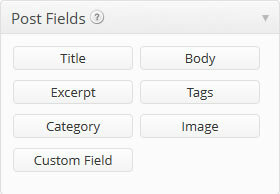 The post fields include the title, body, excerpt, tags, image, category and custom field. All the requirements you need for creating a post. When a form that uses post fields is submitted, Gravity Forms will add the post as a draft. That way you can review it prior to publishing it. How awesome is that? Last but not least are the pricing fields. These fields let you add product and pricing options to your form. While it's not a replacement for plugins like Woocommerce or WP E-Commerce, it does allow you to add the ability of selling things on your site. Of course you'll need a payment plugin in order to accept payments, but it's still useful if you want to create some quote forms. Have you ever needed to add a State drop down list to a form? Remember the headache of plugging in each state? Well apparently the folks at Gravity Forms remember too. Because in the the drop down field they've added a button called "Bulk Add / Predefined Choices"
And it's not for just States, they've add a number of quick insert items. And for some people, that alone is worth the price of admission. And not only did they add plenty for you to use. They also made it so you can create your own. While you're on the Bulk Add window you can fill in the right side with your choices and then click the "Save as new custom choice" and create a new bulk add option. Although, I don't think there is a way to export any bulk adds you create so you can use them on other sites. This looks like a good place to break up this review. Still to come, in Gravity Forms - WordPress Contact Form Plugin Review Part 2, we'll be looking at the pricing and available plugins for Gravity Forms. Thanks for reading this lengthy review, see you in part 2!